Seattle: Superior Publishing Company, 1969. 183 pp. Original gold paper covered boards, very bright and clean. Corners and spine ends mildly rubbed. Light foxing to edges of text block and endpapers. DJ lightly soiled. Approx. 3/4" closed tear from top edge of front panel. Price clipped. Illust. w/ b/w photos. Contents nice.. First Edition. Hard Cover. Very Good-/Very Good. 4to - over 9¾" - 12" tall. Seattle, WA, U.S.A.: Superior Publishing, 1969. Oversized 183pp including index Photos Tiny remainder dot on bottom Dust jacket is scuffed near bottom front corner Repaired tears on edges of dust jacket Protective mylar cover over dust jacket. First Edition. Cloth. Fine+/Very Good. New York: Bonanza Books. Very Good- in Very Good- dust jacket. 1977. Reprint. Hardcover. 0517243350 . Mylar protected dustjacket is edgeworn and price clipped. Boards edgeworn. ; 11" tall . Seattle, WA: Superior Publishing. VG+/VG+; Hardback in Very Good+ condition, Very Good+ dust jacket. 1969. 1st Edition. 4to 11" to 13" tall; 183 pages . New York. : Bonanza Books., 1973.. Reprint.. Hardcover.. Fine copy (book plate) in fine dust jacket (in mylar).. 4to.. Illustrated. Important reference work. . Photograph of OUR copy available upon request. Condition: Fine copy (book plate) in fine dust jacket (in mylar). New York, NY: Bonanza Books, 1979. 1st Ed 1st Pr. DJ price clipped. Gift dedication to the Turpins dated June 1979 inside front cover. Hardbound. 4to. 183 Pgs.. Nr Fine in Good- DJ/Good. 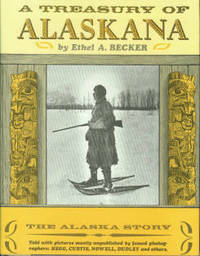 A Treasury of Alaskana: The Alaska Story by Ethel A Becker. Published by Bonanza Books, New York, NY, 1979. 1st Edition1st Printing. Hardbound, Paper DJ. Size 4to (up to 12'' tall). Condition: Nr Fine in Good- DJ. DJ price clipped. Gift dedication to the Turpins dated June 1979 inside front cover. 183 Pgs. ISBN 0517243350. LCCN 73-7768. From the selected work of early Alaska photographers and the research so capably done by the author, a fascinating picture of Alaska's earliest days emerges, from the raids by the Siberian hordes through the mining excitement at the turn of the century - a varied approach to the history of the state we know today. This book is a photo-history find for students, modern ''sourdoughs'' and friends of the 49th state - a comprehensive look at its past as a background for its great future. Description text copyright 2005 www.BooksForComfort.com. Item ID 10051. New York: Bonanza Books, 1969. 1st Edition. Hard Cover. Very Good/Very Good. 4to - over 9¾" - 12" tall. NY: Bonanza, 1977. First printing of the Bonanza edition. Fine in a fine dustjacket. No flaws. Vintahe photos taken in The Last Frontier by Hegg, Curtis, Nowell, Dudley and others.. First Thus. Hard Cover. Fine. New York. : Bonanza Books., 1973.. Reprint.. Hardcover.. Fine copy.. 4to.. Illustrated. Article about the author in front pocket.. Photograph of OUR copy available upon request. Bonanza Books: New York, n.d.(1977). Reprint, 1977. Book. Hardcover. Two-color cloth; 4to.,183pp. Otherwise fine d/j with small spot of peeled glassine, else Fine in Near Fine D/j..
New York, N.Y.: Bonanza. Clean tight no marks boards have slight edge wear only, dj bright clean with only slightest edge wear . Very Good. Hardcover. Reprint. 1977. New York: Bonanza Books. Hardcover. 1977. Reprint. 4to 183pp . Fine in Fine DJ. B&W Photographs. DJ price clipped. Reprint of a book published originally in 1969 by Superior Publishing. The Alaska story told with pictures mostly unpublished by famed photographe rs: Hegg, Curtis, Nowell, Dudley and others . Very Good. Very good hardcover (Bonanza, 1977 edition, 183 pages) in dust jacket, as pictured; pages clean, tight, unmarked; binding sound and square; dust jacket is like new; only defect is partially blacked-out gift inscription on flyleaf; on its way to you the same or next day in bubblewrap; email confirmation; standard (media) mail takes 4-14 days; expedited (priority) mail takes 2-5 days; international orders go by airmail (6-10 days). Seattle: Superior Publishing Company. Very Good in Very Good dust jacket. 1969. First Edition. Hardcover. Ethel A. Becker. A Treasury Of Alaskana. Seattle: Superior Publishing Company, (1969). First Edition. 4to. 183 pages. Gold hardcover. Lower corner bumped, very good plus, owner inscription on front endpaper, few minor spots. Dustjacket unclipped, lightly worn, few short tears. Photo-illustrated throughout. ; Photographs; 10 3/4 x 8 1/2 inches; 183 pages . Bonanza, 1977. Hard cover. Fine in very good dust jacket. Sewn binding. Cloth over boards. Audience: General/trade. Seattle: Superior Publishing Co, 1969. HC. very good w/very good dustjacket (hardcover). B&W illustrations. 183pp. New York: Bonanza Books. As New/Fine. 1977. Cloth Hardback. Oversized 183pp including index Told with pictures mostly unpublished by famed photographers: Hegg, Curtis, Nowell, Dudley and others Fascinating history and photographs . NY: Bonanza Hard Cover. Near Fine/Very Good. NY: Bonanza, 1977. Neat presentation under jacket flap. Another good reference.. 1st Thus. Hard Back. VG+/G+/bottom Bent Up a Little. 4to - over 9¾" - 12" tall.